"I watch the stock market channel all the time—I just watch because I suspect that anchor man of being an evil leprechaun. He can fool everybody else, but he ain't fooling me." Mr. 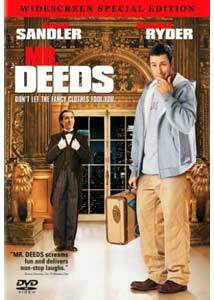 Deeds is a loose, very loose, remake of the classic Frank Capra filmMr. Deeds Goes To Town, and while it is a safe bet to say that director Steven Brill is certainly no Frank Capra, it is more difficult to make the same statement comparing their lead actors. Now, I am not saying that Adam Sandler possesses the talent held by Gary Cooper in any way, but there is something undeniably charming about the way in which Sandler steps into the latter's shoes. Shedding his childlike persona of men who have "anger management" issues, Sandler creates a genuinely likeable character that proves that the former Saturday Night Live funnyman may finally be growing up. Mr. Deeds finds Sandler on the road to the world of romantic comedies he last visited in The Wedding Singer; thankfully, the results are a bit better this time around. Longfellow Deeds (Sandler) is perfectly comfortable living his life as the owner of a pizzeria in the small village of Mandrake Falls, New Hampshire. Deeds has but one dream, to someday write greeting cards for Hallmark, oblivious that he has no real talent. When Chuck Cedar (Gallagher) comes calling with the news that Deeds has inherited a forty-billion-dollar media empire, the news understandably fails to excite him, yet he travels to New York simply to sign the papers and quickly return to Mandrake Falls with his money in tow. Though Deeds may see it as a small event, the crowning of the inheritance to Deeds is perfect fodder for the media in New York, including a third-rate tabloid TV show that will stop at nothing to get the scoop on him. Enter Babe Bennett (Ryder), a reporter for the tabloid show who poses as a woman in distress to catch Deeds' eye. It works, and soon Babe becomes Pam Dawson, a good-natured school nurse whose down to earth values are dear to Deeds' heart. Babe begins to fall for Deeds, and struggles with telling him the truth. Add to this a subplot in which Cedar plans to overthrow the company, as well as a servant (Turturro) who is very sneaky. What elevates Mr. Deeds above other Sandler movies is that, for the first time, Sandler is afforded the opportunity to play a seemingly normal individual. What separates Deeds from the pack is that the script is more focused on the Sandler character falling in love, rather than being subjected to mundane sequences in which the bottom of the barrel is scraped for humor. The romance between Pam/Babe and Deeds works in that we care for the characters and enjoy their scenes together, but there seems to be a level of chemistry lacking between Sandler and Ryder that is inescapable. The two give fine performances, but Sandler feels more comfortable with the supporting cast rather than his leading lady, a flaw that is too large to overlook. In the end, the script makes a nice effort, and a worthy one, but the actors can't quite put the finishing touches on a romance that could have very well been the bright point of the film. The differences between the Frank Capra classic and this remake are numerous, most importantly the fact that the original had a sense of heart, strangely lacking in the update. Mr. Deeds feels more like an exercise than a lighthearted affair. The script, by frequent Sandler collaborator Tim Herlihy, scores points in its handling of the romantic aspects as mentioned above, yet other moments feel as though they are added because the script needs them. A good film has moments of spontaneity that the audience does not see coming; Mr. Deeds works as if it planned on a chart. The same night that I first viewed Mr. Deeds on DVD, I was afforded the chance to see the brilliant P.T. Anderson film, Punch Drunk Love, also starring Sandler. When stripped down to basic elements the characters of Barry in the Anderson film and Longfellow in Deeds are not entirely different. Sandler is a gifted actor in nearly every aspect, and the way the Anderson film shows him in such a new light is that, for once, a script has gotten to the point to which we see multiple layers of the character and his emotions. Providing terrific support to Sandler are a pair of well-known actors in small roles. Both John Turturro and Steve Buscemi light up Mr. Deeds in cameo appearances. Turturro is the high point of the film, in my opinion, as his scenes made me double over in laughter. Image Transfer Review: The 1.85:1 anamorphic transfer is, as is to be expected, terrific in its quality. Sharpness and detail are amazing and the image looks better than it did when I saw the film in the theater. The bright colors of the transfer come off nicely on this disc, with one sequence involving Deeds on a tennis court standing out as nearly perfect. This is a first rate transfer. Audio Transfer Review: Those expecting a bombastic Dolby Digital 5.1 mix will be disappointed as the 5.1 track for Mr. Deeds is largely uneventful. Dialogue is firmly rooted in the center channel, while the surround speakers get no real use to speak of. Extras Review: A commentary track by director Steven Brill and writer Tim Herlihy leads off a long, but disappointing list of extra features. The track is interesting as the pair enjoy a seemingly easy rapport as the film goes along. They never really delve into any great detail about the making of the film; instead, the two delve into more behind-the-scenes anecdotes, including in-jokes as well as funny stories that pertain to the day a particular scene was shot. I enjoyed the track as it provides a light listen, but there is little substance to be gained. A collection of six deleted scenes are included, and I am comfortable in saying that not a one deserves a place in the final cut. The lone standout is one featuring Steve Buscemi and a warm piece of pizza. Funny, but not relevant. Three featurettes are offered including: Clothes Make the Man, From Mandrake Falls to Manhattan and Spare No Expense. The most detailed of the trio is From Mandrake Falls to Manhattan, which looks at the differences between the updated film and the original classic, while featuring numerous interviews with the cast and crew. Spare No Expense looks at the lengths to which the crew went in order to obtain various locations, the best of which being an experimental helicopter used in the film. Finally, a collection of greeting cards as well as trailers for Mr. Deeds, I Spy, Eight Crazy Nights, Master of Disguise, and Men in Black II. Each is offered with Dolby Digital sound as well as anamorphic enhancement. The music video for the Dave Matthews Band's Where Are You Going? is included and is the high point of the extra features. I enjoyed Mr. Deeds for the simple fact that it is radically different from the brainless films that fill out Adam Sandler's résumé. Recommended.